Digital selling is here to stay. Have you admitted that to yourself yet? 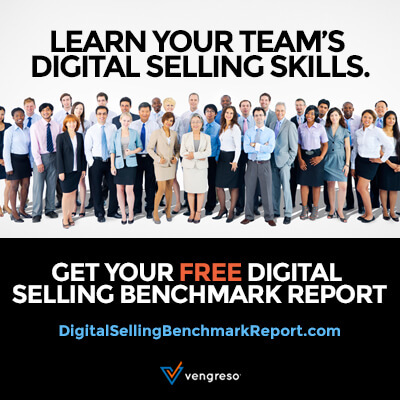 Sales organizations around the globe need to jump on the digital bandwagon. If you don’t, your company is on its way down. But don’t let that deter you. If you don’t have a digital selling program implemented within your sales organization, your excuses are over. This episode of #SellingWithSocial explains exactly how you can do it, incrementally, step by step. It’s a presentation I was honored to deliver at Dreamforce 2018 – “10 Steps To Launch A Digital Selling Program.” I’ve outlined it clearly and have provided many examples, so don’t put it off any longer. Don’t keep wishing for the good old days when technology and social media were not required to engage with buyers and close deals. Those days are gone – forever. Listen to learn how to become effective at digital sales. Sales professionals used to be the keepers of the sacred information. If buyers wanted to know about features or applications of a particular product, they had to engage with a salesperson to get it. Then came the internet. Followed by the smartphone – and the sales game changed forever. Buyers typically research 60% to 70% of their questions and concerns about a product or service before engaging with someone on the sales team. In short: buyers have gotten faster at buying than sellers are at selling. So salespeople need to be out there, in the places buyers are researching their services in order to be relevant to the conversation at all. It’s that reality that sets the stage for this presentation. Sales organizations have to catch up with buyers. The sales process has to take digital engagement and opportunities seriously so that salespeople can be involved in the conversations buyers are initiating and engaging in. This episode will enable you to hit the ground running. Did you know that only 10% of the calls or emails your sales reps are sending out actually earn a response? That means 90% of your company’s potential buyers are never being reached by traditional sales methods. What will you do to address that issue? A digital selling program is the answer. You start your program by defining your desired outcomes, then you identify your ideal buyers and map out the typical buyer’s journey. After that, you have to make sure you have the right bait (content) to attract them. Those are just the first 3 steps of developing a digital selling strategy. Listen to this episode to hear me explain all 10. Do You Have The Right Kind Of Bait For Your Buyer Types? There isn’t space in a show notes page like this to thoroughly outline all of the steps involved in creating a digital selling program. So let me focus in on one of the most important – the bait. Just like fishing, you’ve got to have the right bait to catch the attention of the exact buyers you have in mind. The content you create and share on social media and during the sales conversation is that bait. But it’s not a one-size-fits-all proposition. You need the right kind of messaging to fit each of your different buyer types. That way your sales team can customize their approach, provide exactly what individual buyers need, and engage in sales conversations in relevant ways that lead prospects through their unique buyer’s journey. Listen to learn why the bait has to be more than just infographics and white papers the marketing team creates, how your sales enablement team should get in on the fun, and why you need to have “vaulted” content that’s reserved for your sales team. Does Your Sales Team Know What To Say In Every Situation? I was a feet-on-the-ground sales rep for many years. I know what it’s like to hustle and work for the sale. But I also know this: whenever we get the opportunity, those of us in sales will hit the “easy” button. Sales leaders can’t let that tendency stop their teams from succeeding. That’s why I advocate creating scripts for every scenario. Provide them so that your sales team can easily customize and use them to address buyer questions, speak to particular use cases, and move the conversation forward in ways that make your brand and products look good. Listen to this episode to learn all 10 steps of creating a digital selling program for your organization. [7:12] What are you doing about the other 90% of people you aren’t speaking with?